Zion Market Research has published a new report titled “Community Cloud Market by Components (Hardware and Software), by Professional Services (Consulting Support Services, Training Support Services, Maintenance Support Services, Customer/Public Portal Services, Regulation and Compliance Services, and Other Services), by Applications (Cloud-Based Storage, Cloud Backup and Recovery, Cloud Security and Data Privacy, Web-Based Applications, High Performance Computation (HPC) and Analytics) for BFSI, Gaming, Government, Healthcare, Academia and Education, and Others by Region (North America, Europe, Asia Pacific, Latin America, and Middle East and Africa): Global Industry Perspective, Comprehensive Analysis, and Forecast 2017-2024’’. 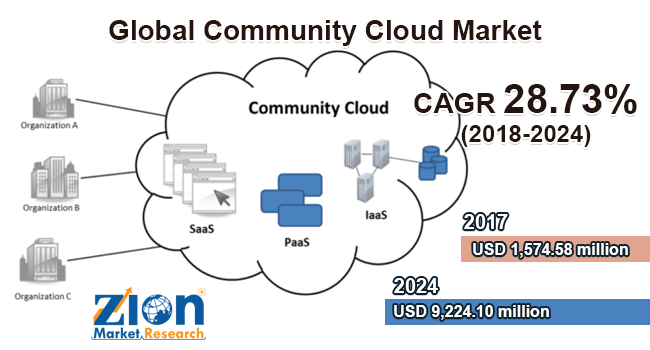 According to the report, global community cloud market was valued at around USD 1,574.58 million in 2017 and is expected to reach approximately USD 9,224.10 million in 2024, growing at a CAGR of slightly above 28.73% between 2018 and 2024. The global information technology sector has been plagued by numerous factors including concerns over data security, increasing operational cost, the intense competition offered by global and local players and many others. Due to these factors, various industry players including small and medium-sized businesses are looking for ways which can reduce costs, improved performance and contribute towards green computing. The community cloud model in cloud computing is a collaborative practice in which the infrastructure is shared between various organizations from a specific community. The community cloud may be wholly owned and controlled by all the user members of that particular community or by a third-party cloud provider that supervises a public cloud with limited access. The rising investments and adoption of community cloud computing model in government and private organizations in verticals such as healthcare, banking, and finance are fueling the growth of community cloud technology in the global market. The necessity of high performance and low latency infrastructure, data security and redundancy, shared cost model are some of the major factors contributing to the growth of community cloud market globally. However, the slow adoption rate of community cloud technology due to trust and security concerns among the organizations using cloud application is restraining the growth of the market. The community cloud market is segmented based on components, professional services, applications, and verticals. The components segment is categorized into hardware and software. The hardware is further divided into the server, storage components, and networking peripherals. The software segment is further divided into enterprise applications, collaboration tools, dashboards, and business intelligence. Professional services segment is categorized into consulting support services, training support services, maintenance support services, customer/public portal services, regulation and compliance services, and other services. Applications segment consist of cloud-based storage, cloud backup and recovery, cloud security and data privacy, web-based applications, high-performance computation (HPC) and analytics. The vertical segment is further divided into BFSI, gaming, government, healthcare, academia and education, and others. Regional segmentation of the community cloud market includes North America, Europe, Asia Pacific, Latin America and the Middle East and Africa with further country wise bifurcation into major countries such as the U.S., UK, France, Germany, China, Japan, India, and Brazil. The major players operating in the global community cloud market are Amazon Web Services LLC, Cisco Systems, Atos SE, Akamai Technologies, Inc., VMware, Computer Sciences Corporation, Google Inc., Amadeus IT Group SA, Microsoft Corp., and IBM Corporation among others.